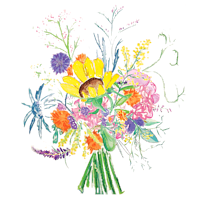 This week's bouquet is a simple testament to the gentle end of spring. Your bouquet may feature the last stems of ranunculus, delicate bachelor buttons, snapdragons, beautiful campanula, and foraged yarrow. We've also thrown in some beautiful wild treasures. What is a Bouquet CSA? A bouquet CSA is a simple and affordable way to access fresh, locally grown flowers for your home, business or even as a gift to a loved one. In the Fall of 2016, Laura Beth and I were at a crossroads. Our oldest son was about to graduate high-school. Our two youngest were 5 years and 9 months respectively. In the evenings, we seriously discussed “what’s next?”. We spoke, and listened, and researched details whenever possible. What could our life look like in this next chapter? Would it be here? Would it be there?